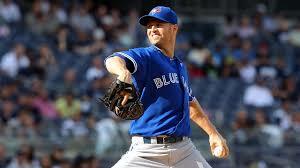 The Toronto Blue Jays have added more depth to their starting rotation, signing left-hander J.A. Happ on Friday to a three-year contract worth $36 million US. Happ spent two-and-a-half seasons with the Blue Jays from 2012 to 2014, where he recorded a 19-20 record and 4.39 earned-run average in 58 appearances (50 starts). The 33-year-old made 31 starts for Seattle and Pittsburgh last season, going 11-8 with a 3.61 ERA and posting career-highs in innings (172) and strikeouts (151). Following a trade to the Pirates in July, he went 7-2 with a 1.85 ERA over 11 starts. Happ had a 62-61 record with a 4.13 ERA over 196 career outings (171 starts). Happy Birthday Justin Smoak ! Still miss Alex Anthopolis ? Are the Blue Jays now Cleveland Indians North ? What do the Jays need in their bullpen ? Should Blue Jays keep Ben Revere ? Should Price post-season performance worry Sox ? What's the next step for the Jays ? Are the Blue Jays still the beasts of the East ? Can Marco Estrada repeat for Blue Jays ?